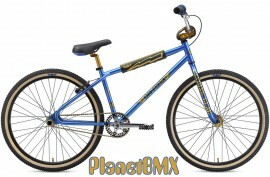 *PlanetBMX lowest price guaranteed plus FREE SHIPPING! Nobody beats our bike prices! The OM Flyer has been around since the birth of BMX cruisers, and is named after the founding father of SE Racing, as well as the sport of BMX Racing- Scot "O.M." Breithaupt. Here we are nearly 41 years later, and the OM Flyer is still going strong. PLEASE NOTE: We can ONLY ship SE complete bikes to USA addresses in the lower 48 States for free shipping. Canada, Alaska, Hawaii and Puerto Rico residents- PLEASE contact us for a shipping quote, as we will need your complete address in order to calculate correct UPS shipping! If you are outside the USA, you MUST go through an authorized SE RACING bike shop in your country. While our website will allow you to add this bike to your shopping cart, we CANNOT process any SE bike orders leaving the USA. If you are an overseas customer, and you pay for a SE Bike order, we will assume that you will be vacationing in our area, and will hold the bike for 30 days for local pick-up. IMPORTANT: To ensure that every component on your bicycle is working properly, PlanetBMX recommends that all SE RACING bicycles be assembled by a qualified bicycle mechanic. Improper assembly of your bicycle may lead to premature wear or failure of individual components. Failure to do so may void the manufacturer warranty. * Please check out www.SEbikes.com for a dealer in your country!